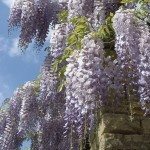 Can phosphorus be added in springtime for wisteria vine? The once-blooming wisteria vine now produces perhaps one or two blooms. The vine gets sun and is pruned in January. Can I add phosphorus now or do I need to wait until the Fall? I would add this about 2 weeks before you expect flowers in your area. Really, though, as long as it isn't dormant you can add it at just about any time.